August Edufun is here for +Pretend City Children's Museum - Head over to check out the end of summer beat the heat events! Friday, August 21: Celebrate Senior Citizens Day! · Growing Up Great Games: Memory Aerobics – Play this fun matching game with us that will merge classic and new cartoon characters to build memory skills and prompt conversations about the past. · Sensational Story Time: The Grannyman – Can you teach an old cat new tricks? 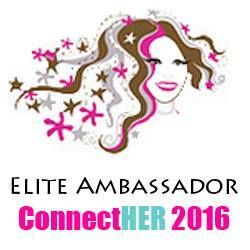 Join us for sensational story time to find out. Fee: Included with museum admission; Senior Citizens 55 and older receive 50% off of general admission today! Thursday, August 27: Celebrate When I Grow Up Day! What do you want to be when you grow up? Do you want to save lives and be a doctor? Or maybe you want to be a graphic designer and create a popular video game for all your friends to play! Pretend City invites all Pretenders and their parents to meet and interact with professionals from all over the community at When I Grow Up Day! 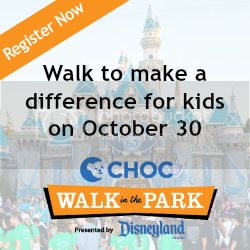 Come meet these accomplished professionals who live within your local community, and who will inspire you and your Pretender to dream big when it comes to thinking of what they want to be when they grow up! 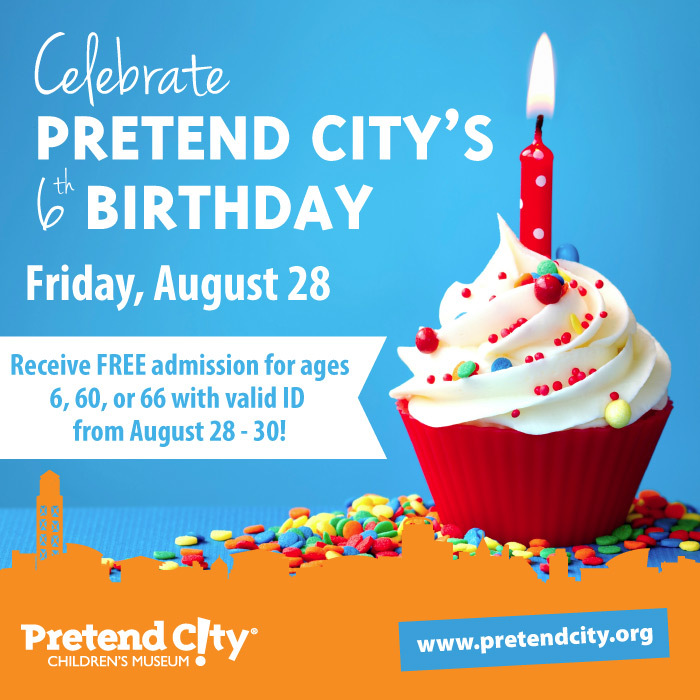 Friday, August 28: Celebrate Pretend City’s Birthday! 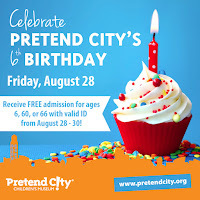 Meet some of your favorite characters as they help Pretend City celebrate our 6th Birthday! Enjoy a slice of birthday cake, make a birthday hat, get your face painted and pose for a photo with your favorite super hero or princess. All included with admission! Are you celebrating your 6th birthday too this year? Bring in proof and you’ll receive free admission on Friday, Saturday and Sunday, August 28, 29, and 30th. Saturday, August 29: Celebrate Raksha Bandhan! · Smart art: Handmade Rakhi - Children will be able to make their own rakhi’s to gift to their loved siblings, family, or peers. · Sensational Story Time: One Busy Day – Enjoy this delightful story about a brother and sister who find out that being busy is more fun together! · Let’s Move: Kids Versus Grown-Ups - Since today is all about the bond between siblings, let’s have them team up for a fun, active movement game. Fee: Included with museum admission; To celebrate this special day siblings will get in FREE for every general child’s admission ticket purchased!